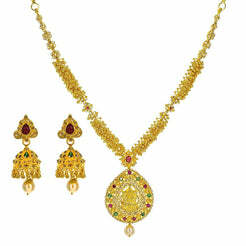 18K Multi Tone Gold Diamond Earrings & Necklace Set W/ VVS Diamonds on Flower Accented Chain for women. This beautiful set features a series of flower accents encrusted with 2.9ct VVS diamonds with E-F color and round brilliant cut. 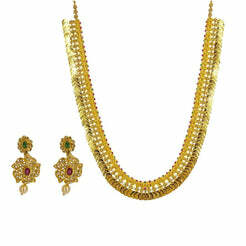 The necklace is 18" long with a width range of 4-13 mm. The pendant is 28 mm long and 18 mm wide. Each earring is 29 mm long and 14 mm wide. The set weighs a total of 42.3 grams. 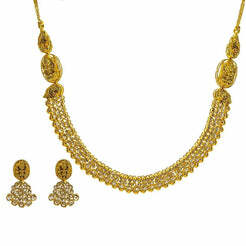 This set is ideal for a touch of elegance at a formal affair.